You didn't have today off, did you? You're actually sitting at your desk and enviously reading your friends' Facebook and Twitter updates about how they're sleeping in or catching a movie... and wishing you could join them. Alas bills must be paid, and that shoe collection won't grow on its own (at least it's only a half day). Still, I pity the fool who crosses you today. 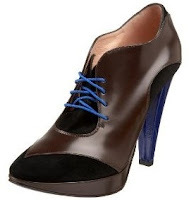 Let them know you're not in a playful mood with a serious pair of oxfords, like these lace-up booties by Jean Paul Gaultier (available via Endless.com). The reverse spectator styling on the front, combined with the dark color palette of brown, black and blue says you mean business. It has a 4.5 inch heel with a .75 inch platform (only a 3.75 inch incline), so if you need to stomp your feet a little, it won't hurt too bad. When the closing bell rings, and you grab a drink to toast the accomplishments of good ole George Washington and Honest Abe Lincoln, make it an El Presidente. While I've come across a few different ingredient lists for this drink, the one I liked best was listed on The Science of Drink (via Esquire). It combines white rum (we enjoy 10 Cane Rum), orange curacao (maybe try Hiram Walker), dry vermouth and a dash of grenadine. Yes, it's dark liquor season, but in the spirit of independence, you're free to drink as you please. Just don't drink too much. There's a huge difference between being head of state and a ward of the state. Got it? what a fun concept, shoes and booze! :) Those Gaultier booties are fab! Thanks so much, Tiffany! I hope you'll check back often.